Printer. Paper. Rubber band. Two rolls of 35mm film. Do you have these things? Great. Let's make you a camera. 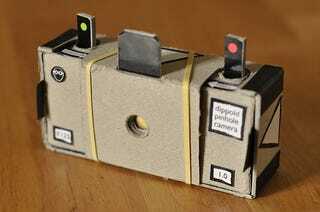 The pinhole camera is about as simple as design gets. As opposed to lenses and fancy shutters, the pinhole design features the most basic design ideal—a hole in a box. A flickr member has shared the template for the swank pinhole camera you see above here, along with step by step instructions (including a handy chart for exposure times) for assembly/operation.